A swimmer taking part in the 17-mile swim on Saturday, Aug. 13, neared the finish line at Coney Island's Steeplechase Pier. KIPS BAY — Lori Carena was one of six swimmers who jumped into the East River on Saturday morning and swam 17 miles, stroke by grueling stroke, from East 26th Street in Manhattan to Coney Island’s Steeplechase Pier. Carena had a couple of superlatives going for her that day. At age 57, she was most likely the oldest swimmer in the water, she said. More importantly, she was the fastest. Carena swam those 17 miles in five hours and 47 minutes, beating her closest competitor by about four minutes. “It was very special for me to win one, because I can usually do OK in my age group but not against the younger crowd,” Carena said. The event was held in honor of Rose Pitonof, a 17-year-old swimming phenom who became the first woman to complete that same Manhattan-to-Coney-Island course in 1911. Deanne Draeger organized the event after swimming the stretch of New York waterway herself in 2010, on the 99th anniversary of Pitonof’s swim. Draeger also invited several members of Rose Pitonof’s family to attend, including Pitonof’s two-year-old great-great-granddaughter, Evelyn Rose, who helped hang a medal on Carena’s neck after she won. Carena, a mother of three who lives in the Carroll Gardens section of Brooklyn, has spent much of her life in the water. She swam competitively as a child growing up in the Bronx, and she continued in college. But it wasn’t until she reached her early 40s that she started swimming in open-water events. 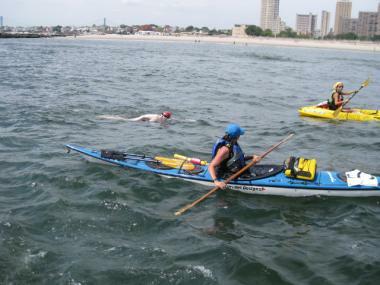 Carena completed the 28.5-mile Manhattan Island Marathon Swim in June, and she has participated in multiple five-kilometer, 10-kilometer and 10-mile swims. But Saturday’s race was her first official win. The victory wasn’t without its challenges. Information on the event’s website warned participants to expect some choppy conditions on race day, and the wind and waters around New York delivered just that. Carena started off in the lead, but when she crossed the East River, the other swimmers caught up. Around the Verrazano bridge, she regained her top spot and kept it all the way to the end. One of the best moments of the race, she said, came when she passed Norton’s Point and caught sight of Coney’s Island’s signature parachute jump. She knew she was just a few miles from the finish. “And then you know you’re going to make it,” she said.